As well as the Marriage of Nolulama and Luthando 2006. 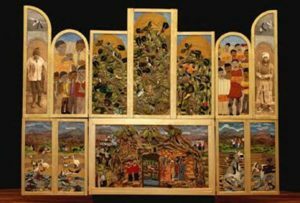 And showing at a different venue is another work from 2006, the Rose Altarpiece which can be seen at SARChI Research Centre at 33 Twickenham Rd Auckland Park (maybe phone beforehand to check access 011 559 1705/1111. And while all artworks need to be seen ‘in the flesh’ (to mix metaphors), it is even more crucial in the case of these works as photographs really do not capture the scale, detail and differing techniques and textures. Confronting them directly the effect is astonishing. 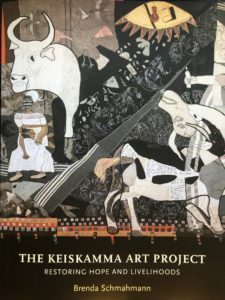 Stay at our well located Guest House and visit the Keiskamma Art Project. View our Craighall Guest House for Rates and Availability! 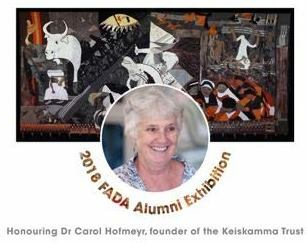 Carol Hofmeyr is the inspiration behind the Keiskamma Art Project. Carol is a medical doctor who also completed a Master’s degree in Fine Arts in what was then the Wits Technikon, now part of the University of Johannesburg – hence the Alumnus connection. Her CV is impressive to say the least as it shows the degrees she managed to complete and the development work she was involved in while still working daily as a doctor. Astounding and humbling are adjectives that could get very over-used in this post. Carol moved with her husband to Hamburg, a small village in the Eastern Cape in 2000 and was confronted in a very raw and immediate way with dire levels of poverty and deprivation. The devastating effects of the disruption of the social fabric during colonialism and then apartheid were still harshly felt in the Eastern Cape, all exacerbated by the prevalence of HIV/AIDS. Human beings make art to find and give meaning. To make sense of things. To heal themselves. To continue to wonder at and be in awe of this one life and this one world. I need to go back to make art just for myself to regain my own wonder and worship. I too need this healing. 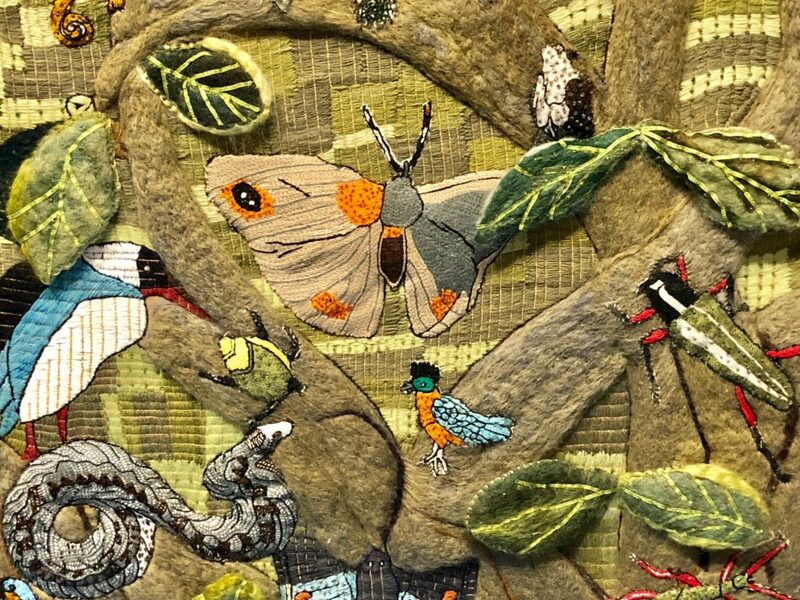 Carol began working with local people, women initially, encouraging and guiding them to work collaboratively in making large scale artworks using fabric, embroidery, beadwork and needlework. 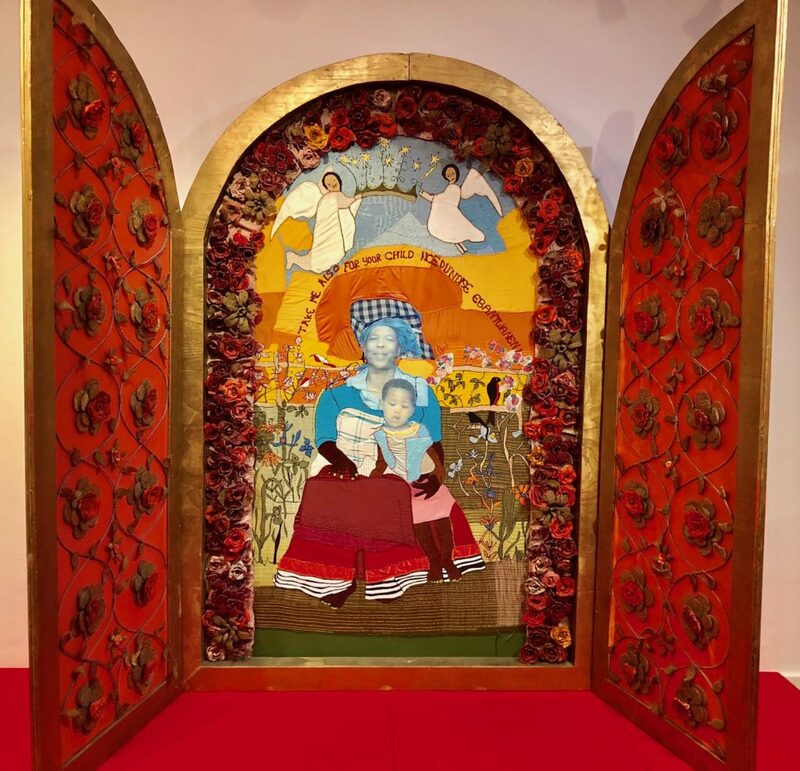 These works draw inspiration from large scale works from art history, works such as the 11th Century Bayeux Tapestry, Van Eyk’s Ghent Altarpiece 1432 , Picasso’s Guernica 1937 and Grunewald’s Isenheim Altarpiece 1516 (for another blog). However while drawing on genres and conventions of canonical Western works, in the Keiskamma work, motifs, themes, material and techniques are completely adapted to contemporary issues affecting local people in Hamburg and the surrounding villages. 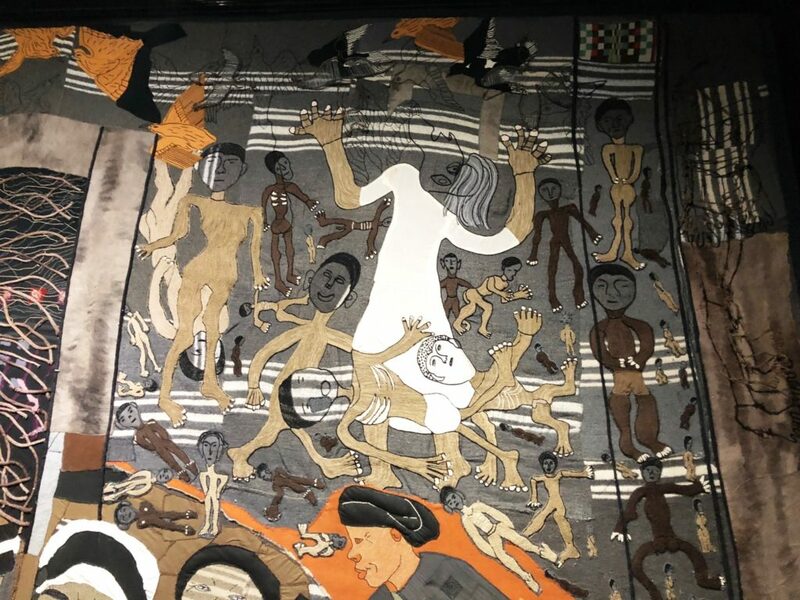 Sadly the FADA gallery is not large enough to display this monumental work (some 3.5 X 4.5 m) as one totality, so the upper and lower parts of the piece have been separated and are shown alongside each other. I was fortunate enough to see the work at St Francis Church in Parkview when it was shown in Johannesburg shortly after being completed. This would have been a context that approximated its unveiling at the Cathedral of St. Michael and St. George in Grahamstown in 2007. 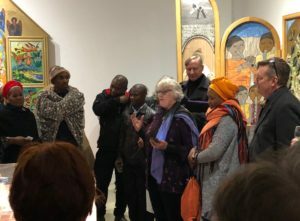 Based on Van Eyck’s Ghent altarpiece, the work takes local issues and symbols using representations of community members and their experiences. 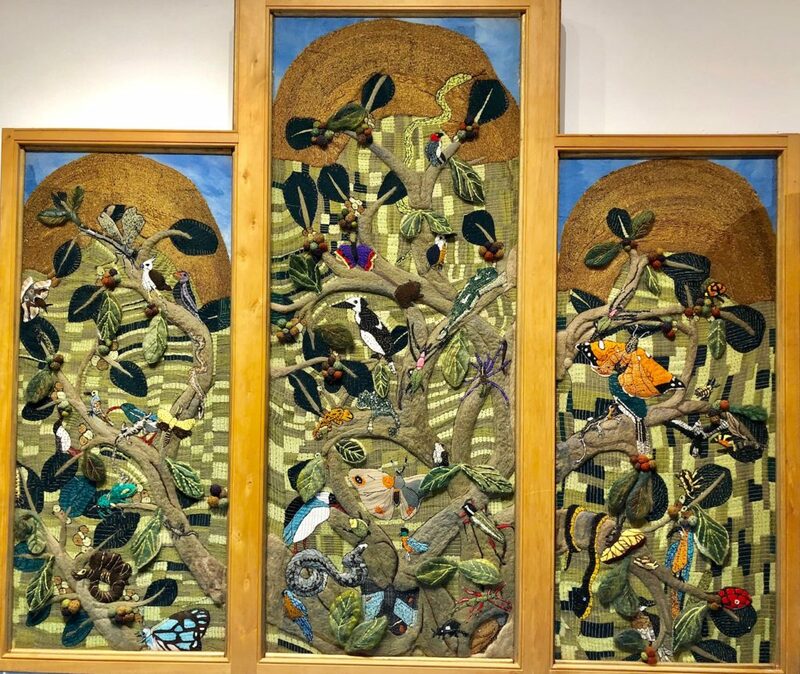 While other works refer more directly to the scourge of HIV/AIDs, this work is more celebratory of the abundance of the natural world and its creative potential. Creation Altarpiece opened. Keiskamma Art Project. Van Eyck’s central image of the Lamb of God on the altar is interpreted in the Creation Altarpiece as a cow (an animal of huge significance in Xhosa culture) under a fig tree. Local bird and animal life replace the parade of worshippers in the lower outer panels. And significant local community members replace Adam and Eve and the choirs and musicians in the upper outer panels. Ghent Altarpiece and Creation Altarpiece with the wings closed. 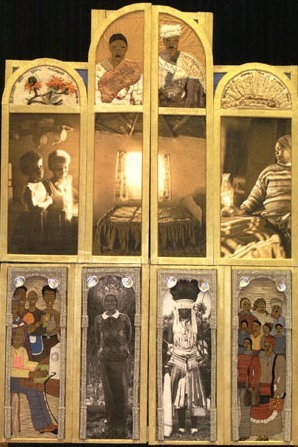 Van Eyck’s Annunciation scene is depicted by the Hamburg men and women using photographs which locate the scene in a local Xhosa household with two children (twins) replacing the Angel Gabriel on the left and a local woman, Nonyamako Gqwaqe, pregnant at the time, as the Virgin Mary on the right. Below the sunlit bed in the house, 2 community elders echo the positions of John the Baptist and John the Evangelist (painted by Van Eyck in grisaille to imitate marble sculptures). 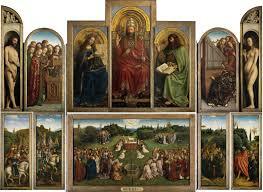 The arches are exquisitely beaded with abalone shells echoing the decorated niches in the Ghent altarpiece. 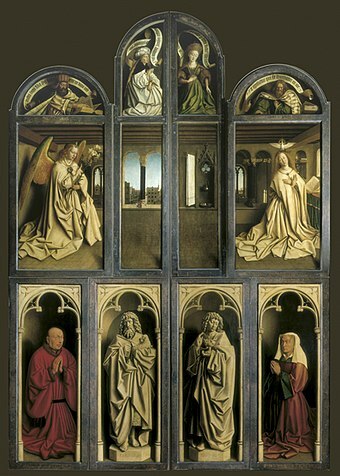 And the donors of Van Eyck’s altar piece (depicted in the left and right panels) have been replaced by members of the Keiskamma project. While there had been great improvement in the treatment of HIV/AIDS with residents in Hamburg and surrounds getting access to anti-retroviral drugs in late 2005, in 2009 policy changed and all locally manufactured antiretroviral drugs were to be distributed by state hospitals and clinics. This meant that sick patients now had to travel more than 100 kms to large centres for treatment. This along with a few other factors (clearly outlined in the text exhibited alongside the work at FADA), meant that there was a serious decline in the control of HIV and increase in deaths because of AIDS. By late 2009 a mood of despondency and despair settled over Hamburg. It was in this context that the gut-wrenchingly powerful Keiskamma Guernica was made. 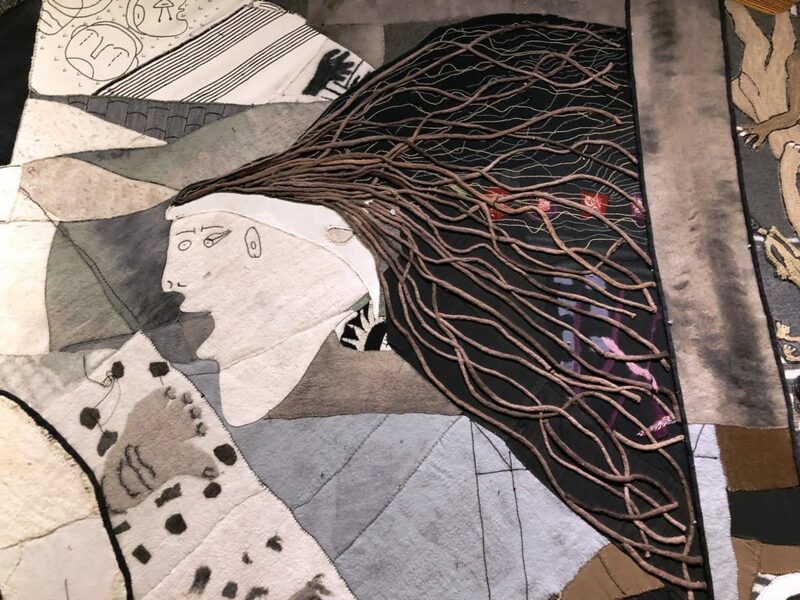 Based on Picasso’s work of 1937 responding to the bombing of the Spanish town of Guernica during the Spanish Civil War, the Keiskamma work speaks to the scourge of HIV/AIDS and its horrific impacts on the local population. 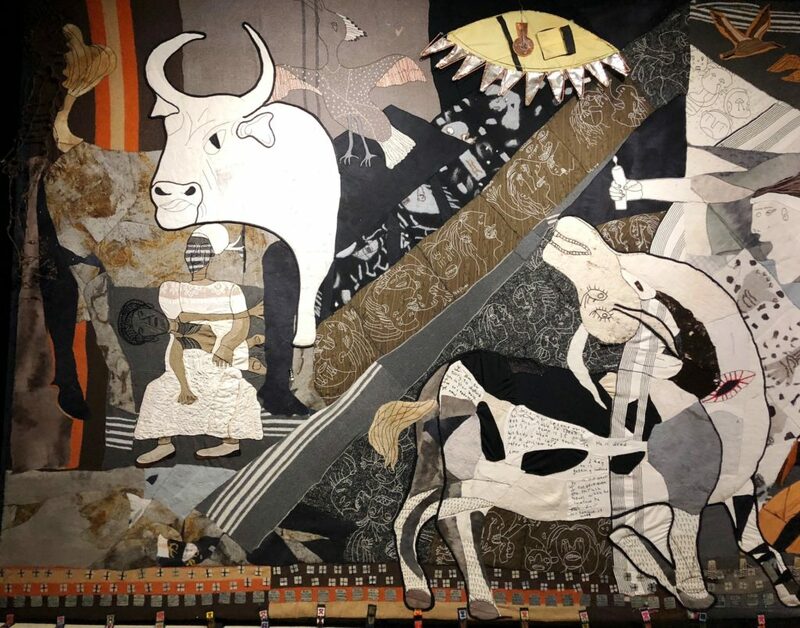 While Picasso’s Guernica is monochromatic and invokes the Spanish tradition of bull fighting, in the Keiskamma Guernica, the earthy tones of the found materials and used fabrics, as well as the wounded bull (as compared to Picasso’s wounded horse), all speak to suffering and devastation in the specifically local context. Available for purchase at the exhibition is the excellent book authored by Professor Brenda Schmahmann who heads the SARChI Research Centre at the University of Johannesburg. Meticulously researched and beautifully photographed, the soft cover sells for R399 and the hardcover for R499. It is highly recommended. And it’s a great addition to Liz at Lancaster‘s library of reference books for guests. And please don’t miss this exhibition. 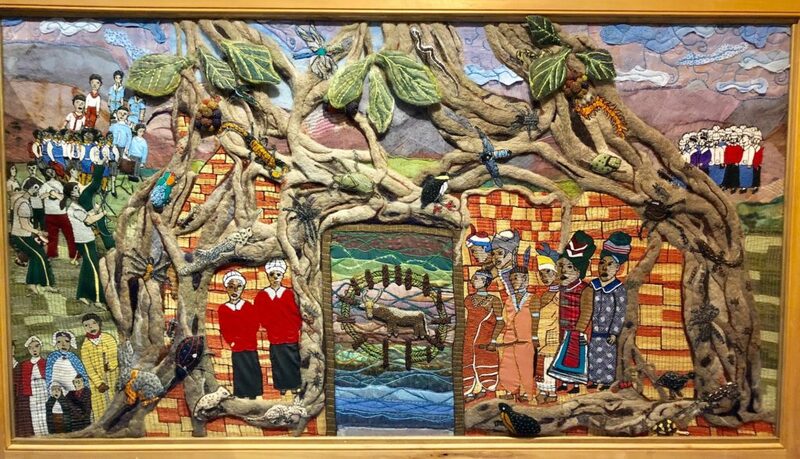 It is an extraordinary testament to the power of art to re-establish dignity and meaning in people’s lives; and, as importantly, to establish employment and a sustainable income stream; to the commitment, creativity, skill, and involvement of the more than 130 members of the project; and to the dedication, hard work and vision of Carol Hofmeyr in founding and guiding this collaborative effort over the last 15 odd years. Humbling indeed.